A co-founder of the Black Lives Matter movement compared President Donald Trump to Adolf Hitler and declared him the "epitome of evil" in a new interview published Friday. 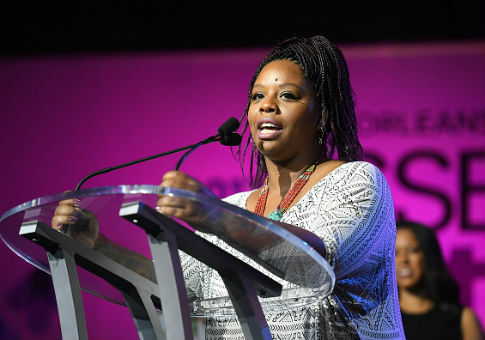 The Los Angeles Times asked Patrisse Cullors in the interview if the "door is open" to meet with Trump. "It's not. And we wouldn't take the invitation," she responded. "We wouldn't as a movement take a seat at the table with Trump, because we wouldn't have done that with Hitler," Cullors continued. "Trump is literally the epitome of evil, all the evils of this country—be it racism, capitalism, sexism, homophobia." "He has set out some of the most dangerous policies, not just that impacts this country but impacts the globe," she sad. "And so for us, the answer is not to sit with him but to resist him and to resist every single policy that he's implemented that impacts our communities." Cullors said that one day she wants to tell her children "that I resisted a president at all costs, because this president literally tried to kill our communities, and is killing our communities." The activist's remarks came two weeks after she defiantly claimed on MSNBC that neo-Nazi speech is not protected under the U.S. Constitution. "Hate speech, which is what we're seeing coming out of white nationalists groups, is not protected under the First Amendment rights," she said. This entry was posted in Politics and tagged Black Lives Matter, Patrisse Cullors, President Trump. Bookmark the permalink.